To see from Tupelo: From Hwy. 78 and 45, take Hwy. 45 north 11 miles to Guntown. Turn left on Hwy 348 (Main Street) and go 7.3 miles to State Route 9. Turn right (north) and go 3.2 miles to County Road 171 (there is no sign, but there is a closed country store here). Turn left on C.R. 171 and go 1.5 miles to C.R. 225 (No sign). Turn left on 225, go 1,200 feet and see signs. To see from Blue Springs exit: Take S.R. 9 north 12 miles to C.R. 171. Follow instructions above. To see from New Albany: From 15 and 348 go east on 348 about 11 miles to S.R. 9. Turn left, go 3.2 miles to C.R. 171. Follow instructions above. This land is about nine miles north of the Toyota Plant! 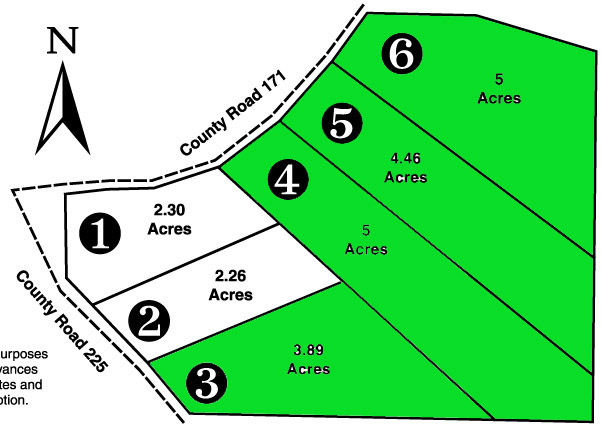 Farm Acres Price Mo. Pmt. Price and payment based on $495 down and owner financing over 360 months at 11.9%. No penalty to pre-pay or pay off mortgage at any time.